A new report outlines how high performing specialist trusts have the potential to do more to benefit the wider NHS. A review of around one-third of England’s 21 specialist trusts looked at why they consistently score higher than their counterparts in ratings for performance and satisfaction. It was carried out by two leaders from the AHSN Network, who recommended seven ways in which local systems can benefit more widely from the role of specialist trusts. 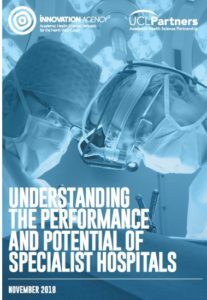 The review focused mainly on the North West and London where there are clusters of specialist trusts, to explore the reasons for higher performance indicators – and to identify whether there is potential for them to do more. The report authors were Dr Liz Mear and Dr Charlie Davie. Dr Liz Mear, Chief Executive of the Innovation Agency, the Academic Health Science Network for the North West Coast, said: “It is well known that specialist trusts enjoy consistently high ratings from CQC inspections, staff and patient surveys. Dr Charlie Davie, Managing Director of UCLPartners, said: “Specialist trusts are frequently seen as the ‘honest broker’ in their local systems and many have taken on cross-cutting leadership roles which we feel could be formalised and expanded. Every specialist hospital should establish a formalised partnership with their local AHSN to take forward service innovation and accelerate adoption and spread. The report was commissioned by the Federation of Specialist Hospitals and the full version is available here.